While thunderstorms can occur during any part of the year, we all think of Spring as “thunderstorm season”. With the warming of the weather comes an increase in convective weather. This is an excellent time to review the windshear and radar section of your Company Flight Manuals as well as the company Flight Operations Manual guidance. More than 80% of the world’s severe storms occur in North America, but there are still plenty of storms in Asia and Europe. Weather avoidance begins in the preflight planning stages. There are a number of tools available to aid us in our decision making. What is surprising is how under-utilized some of these tools are. This article is intended to provide some practical considerations on the tools available for weather avoidance. Company and government publications are still your primary resource. In the U.S., if there is significant weather, ATC may implement a Severe Weather Avoidance Plan, or SWAP, which may eliminate some of the planning that we need to do. Absent a SWAP, we need to look at the big picture and get some preliminary ideas on the best way to minimize the weather encounters we might have in flight. Our primary assets at this point are satellite, radar and lightning maps. We can support this further by current weather reports, forecasts and PIREPS. Internationally, the availability of this information varies. We also have our flight dispatcher. Dispatchers have access to a full array of weather maps, in addition to programs such as Flight Explorer, which depict the aircraft, navaids and a variety of weather products which can be overlaid. Your dispatcher can help provide a route that will minimize the time you spend enroute avoiding weather. A good dispatcher will be a great asset to utilize throughout the flight. Their “big picture” displays, coupled with easy access to meteorologists or other weather data provide them with a lot of information. They can often tell you where the weather is, where it is moving and help you plan a route that will take you around the bulk of the weather. Additionally, as smart phones and connected devices, such as I-Pads are becoming more common, many weather products are available from the aircraft ramp. The use of these devices after push-back may be limited by your company opspecs. Regardless of how you accomplish it, it is important to try to get a picture of the weather close in to the airport, as well as along the route of flight. Taxiing out, the portable electronic devices are generally required to be turned off. While dispatch is still available, contacting them is a bit more challenging due to the workload. While monitoring ATC can offer more clues as to what other aircraft are experiencing, we need to be careful to not read too much into that information. History has shown that crews following other aircraft have often been led into the teeth of a developing severe weather situation. This is not to say that there is no value in evaluating what preceding flights are experiencing, just to emphasize that it needs to be one of many data points, rather than a primary decision factor. In many International locations, the dispatcher may be your best support. ATC may not be able to provide any information due to lack of equipment and/or language differences, and operations in local languages can pretty much eliminate any information we might gain by monitoring other traffic. Arguably, our best available tool for real time decision making is our onboard weather radar. Our onboard radar is limited by several factors. In addition to only displaying weather directly in front of the aircraft, when on the ground, or low altitudes, the radar is effectively limited in its ability to “see” convective weather that is relatively close in. Our radars are limited to 15 degrees tilt. One degree of tilt moves the beam approximately 1,000’ every 10 miles. Using that formula, you can see that if you are 5 miles from the weather, the highest you can “see” above you is 7,500. At 10 miles, just 15,000 feet. Rain at 7,500 is too low to be able to determine if the weather is convective or not. It might be heavy rain, but only rain. It is also possible for light or moderate returns to be displayed while heavy to extreme precipitation is up high, above the tilt range for your radar (more on this later). Additionally, heavy rain will be attenuate, as the aircraft radar will not penetrate very far into heavy returns. For this reason, prior to takeoff, if there is any doubt, utilize ATC, dispatchers, visual cues and any other resources you can think of, to the extent possible to provide a complete picture of what you are departing into. While the capabilities of ATC outside the U.S. is a very mixed bag, ATC in the U.S. has several layers of weather display capabilities, depending on the type of facility. On departure, the TRACON (Terminal Radar Control) utilizes what is known as Airport Surveillance Radar (ASR). The displays are near real-time, and most locations are equipped with the more advanced ASR-9 or ASR-11, which can display six levels of precipitation intensities. Unlike our aircraft radar, ATC radar is not limited by vertical tilt, nor will it fail to display weather due to attenuation. This means that terminal ATC may have a better picture of the weather close in to your position than we can get with our onboard radar units. The capability of TRACON weather depiction varies. In addition to the basic displays described above, 36 locations have additional capability through a system called Weather System Processor (WSP), which provides enhanced weather displays which also can detect the doppler wind shifts present in low altitude windshear. The ASR display is updated with each sweep of the antennae, so every 4.8 seconds. Additionally, there are over 40 airports that have Terminal Doppler Weather Radar (TDWR), which provides far more capability in detecting weather. If the facility does have TDWR, that is part of a system called Integrated Terminal Weather System (ITWS). This system, actually part of the Center Weather Service Unit (more on this below), provides windshear, microburst, gust front and tornado signatures from the TDWR antenna and precipitation information via NEXRAD. It will display this information for the final approach course, to three miles, and to two miles on the departure course. Gust front information is shown in a 10 and 20 minute prediction line, with direction and speed. You do not get both. Those terminal locations that have TDWR do not have WSP, and, unfortunately, many locations have neither. While the TDWR is displayed so the Tower controllers can see it, the TRACON radar scope does not show TDWR displays. The TDWR display terminal for the TRACON is located only at the supervisor’s station. The controllers will get an alert for a potential windshear, but the weather displayed on their scope will be limited to the standard ASR-9. Workload could limit the ability for the supervisor and controller to communicate the particulars of the weather timely enough to be of value to our decision making process. The time that we may need the most weather information is also when the ATC workload is the highest. Unfortunately, FAA funding has not been sufficient to allow for the installation of these displays at the controller stations. Once we are airborne, the dynamics change a bit as onboard radar starts to find some advantages due to our altitude. When we are above the “low altitude” stuff, we can start to differentiate between what is convective and what is not. Airborne radar’s inability to “see through” heavy returns is still a disadvantage, however, with that, comes more definition of the outer edges of the cells. The aircraft radar runs about ten times the frequency of ATC radar, and it is much less powerful (peak outputs in the 25KW range vs. just 150 watts!). This combination is why our airborne radar attenuates easily. On the plus side, though, our higher frequency allows the airborne system to “see” smaller water droplets and provide more definition than what ATC can get. 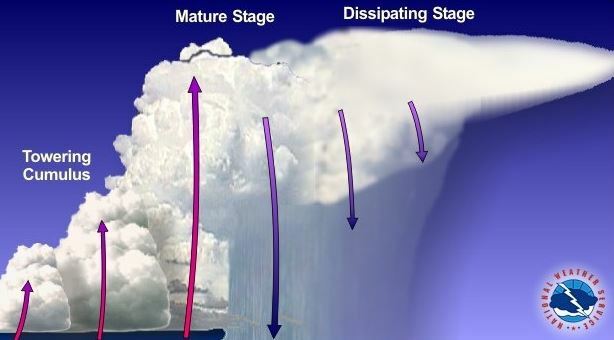 We also can focus it to get an idea of the vertical development of the weather. ATC radar is a great complement to our limitations, as it can still power through the strongest precipitation without attenuation to see through the other side of the radar echo you’re seeing. The best combination can be obtained by utilizing ATC’s ground-based radar to supplement our higher definition airborne radar. We do not need to deviate around heavy rain that is just low altitude, but that weather that extends up into the flight levels is a different story. Use the radar tilt to determine how high the wet rain is getting. The higher the rain (wet precipitation) is getting, the stronger the storm. Changing the tilt 1-degree will move the radar beam 1,000’ at a distance of 10 miles. Utilizing this formula, we can adjust the radar beam to find the weather at the altitudes that matter. However, before we do that, we need to be sure where the bottom of the beam is. All of our aircraft have a 30” dish, which results in a beam width of approximately 3.5 degrees. That means that if we are set on “zero”, the bottom half (1.75˚) of the beam is going to be moving below the aircraft altitude at about 1,750’ for every 10 miles (although this is offset a bit by the curvature of the Earth). As the calibration can be slightly off, depending on the aircraft and radar unit, in order to determine what we need to avoid, we first need to know exactly where the bottom of that beam really is. Utilizing the same tilt formula, we can easily determine it by the following fact: When the bottom of the beam is tilted down at a 10˚ angle, the beam will hit the ground at the same distance in miles as the aircraft height about the ground, divided by one thousand. For example, if you are at FL350 over terrain that is about 1,000’ MSL, you are about 34,000’ above the ground. Tilt the radar down until the ground return is at 34 miles, and that is the 10˚ down point for the bottom of the beam. Very simple and, once you understand it, requires none of the math calculations which might be challenging when you’re getting bashed about in turbulence. Now, just rotating it up 10˚ will align the bottom of the beam with the aircraft altitude until the curvature of the Earth starts to have significant impact. We want to look for weather that is extending vertically into the flight levels. Use the tilt formula, and find the altitude where the bottom of the beam is first hitting the weather. If you are at FL200 and the bottom of the beam is hitting weather aligned with your altitude, you are probably looking at convective weather. If you are at 10,000’, you will probably want to rotate it upwards. Let’s assume the weather is 50 miles in front of you. If you are hitting weather with the bottom of the beam 2˚ above level, you are seeing something that is extending up to 20,000’. If you are 30,000’, you will want to tilt it down to ensure that you are capturing the weather. The reason is that the precipitation at FL300 will likely be frozen, and may not be picked up by your radar. Momentarily turning your gain off the CAL position might help with this, but frozen precip just does not reflect very well. It is, therefore, very important to remember that just because you are not showing precipitation at your altitude, does not mean that you do not have severe weather at your altitude. The rain shaft might stop at FL 250, but the severe weather may extend thousands of feet above that, and just not be reflecting due to it being frozen. In addition to the problems our aircraft radar has with “close in” weather, due to tilt limitation, we run into another set of problems with weather that is farther out. The weather intensity the radar displays starts from how much of its beam is reflected back to the unit. If the beam has widened to the point that a cell is only occupying a portion of the beam size, the energy being reflected back will be less. Although our radar units have some compensation for this, there are limitations on that. [i] Furthermore, as our radar is not really designed to penetrate the weather, attenuating fairly easily we only have limited ability to see “through” a storm to the other side, and, as is fairly well known, significant weather can be “hiding” behind the weather we see. Again, we can gain additional insight into the weather by utilizing ATC, dispatchers or other ground-based sources to put together the “big picture”. The weather displayed on enroute U.S. controller’s ARTCC (Air Route Traffic Control Center) displays differs from what the terminal controllers have. First, all U.S. ARTCC’s have a Center Weather Service Unit (CWSU). This is staffed with a NOAA NWS meteorologist, who can assist ATC with weather issues. The CWSU provides regular briefings to the ARTCC traffic management unit (TMU) as well as the TRACONs (Terminal Radar Control) within their service area. The CWSU has the ITWS system, which is monitored by the TMU and, as previously described, the Tower and TRACON. A limitation, like the terminal controllers, is that during the times when the most deviations are occurring, the workload is very high on the controllers, so they may not have the time to request more detailed assistance. Offsetting this limitation a bit, the Center weather depiction on the individual controllers scope is more sophisticated, utilizing a Weather and Radar Processor (WARP), which integrates weather data from one or more NEXRAD sites. It does not display anything less than moderate precipitation. Additionally, controllers can set their scopes to display weather in four altitude blocks, starting at the surface to FL600, starting at the surface to FL240, FL240 to FL 330, and starting FL 330 to FL600. By asking ATC what altitude range they are depicting, you can determine if what they are showing is low altitude stuff, or something at your altitude. You can ask them to toggle to FL240 or 330 to get a better picture of the vertical development, thereby possibility differentiating real cells from just general areas of rain. ATC radar seems to pick up dry precip better than airborne units also, although they do not depict anything less than 30 dbz, so it already is fairly heavy. ARTCC can provide valuable “big picture” weather information. The limitation is that the controller may not be able to provide much information beyond the area of their individual display, unlike many dispatcher’s ability to zoom out to your entire route of flight. The CWSU has that capability, and ATC uses it for traffic management, but obtaining that information for your individual case would be dependent on ATC workload. Still, for that weather that is within the controller’s coverage area, ATC can be easier and faster to communicate with than a dispatcher or other ground-based person, and can provide immediate information on weather directly in front of you, which can be particularly valuable when the airborne radar is attenuated. Generally, we see attenuation occurring in two scenarios. One might be when there is heavy rain in front of us, and that is blocking the radar’s “view” of what is on the other side. This sort of attenuation is important to be aware of as we might discover that the area behind the storm is not a gap like we might have thought. The other scenario is when we are in the rain itself. Heavy, low altitude rain over a wide area makes it a lot more challenging to identify any convective activity that might be hidden within it. The flight manual may provide some guidance for this scenario, recommending a higher tilt, to hopefully, be able to “see” weather that is rising above the low altitude rain, or, to avoid the area that is bowing “inward” toward you, as that might indicate an area of even higher attenuation. It can be deceptive, with the area with the higher attenuation potentially appearing to be a short cut out of the weather. Southern Airways flight 242 encountered such a trap in 1977, chasing what appeared to be the closest way out of the weather led them directly into the jaws of a level 5 thunderstorm. At altitude, the airborne radar has an advantage that we can get a lot better definition and may see gaps we can fly through at our altitude – just be cautious to ensure that the gap is not just a dry pocket within a storm. However, if we are flying along in the precip itself the entire display can attenuate. In this scenario our radar is likely to just depict precipitation in a solid arc of weather across the display. It can be just a little better than useless. If you find yourself in this situation, flight planned to fly at 10-15,000 feet, stuck in the rain, one strategy might be to continue up to the lower flight levels, to a point that you are out of the rain and able to utilize the airborne weather radar. Another choice, and an equally valid one, would be to request ATC’s assistance in this scenario. ATC will not be faced with the attenuation issues, and the controller should be able to identify areas of more intense weather. As previously stated, you might consider asking Center to toggle their display to only depict the weather above FL 240, as anything that was depicting at that altitude is very probably significant convective weather. A different scenario is a longer flight, where you know that at some distance ahead there is some weather. For this situation, dispatchers can give you a good idea of how you might plan the route by providing fixes or even lat/lon’s that will take you around the weather with minimal deviations. When selecting a heading to avoid weather, be cognizant of the wind drift. A nice advantage for those aircraft that can display the aircraft track is the ability, in track mode, to move the track cursor so the aircraft will actually track around the weather, reducing the amount of deviation corrections that otherwise might be required. Approaching the terminal area brings about a new set of issues. Recall the limitations on radar tilt discussed earlier. On August 2, 1985, Delta 191 approached the DFW area[ii]. The ATIS described the weather as benign, scattered clouds at 6,000’, 10 miles visibility and calm wind. There were scattered thunderstorms in the area, and the flight made a few diversions inbound. At 1756 CDT, ATC transmitted that “…there’s a little rainshower just north of the airport…”. The Delta 191 crew told ATC they were at 5,000 feet at 1800. At 1802 they were 6 miles from the outer marker. At 1804:18 the first officer stated that there was lightning coming out of the cloud in front of them. They reached 1,000 AGL at 1805:05, and the aircraft crashed at 1805:58. During this same time period, NWS radar showed a level 3 cell off the end of the runway at 1756, which had intensified to a level 4 cell by 1804. But what did the crew see on their radar? This was a storm that was developing significant weather at higher altitudes, which, once reaching critical mass, would essentially dump the rain downward, along with the significant wind, which would doom this flight. 1800 CDT, and 5,000’, the flight was about 20 miles from the airport. If, like many crews, they had their radar tilt at around 5˚ nose up, they would be viewing weather at around the 15,000 foot range. It is probable that this was not high enough to detect the severity of the storm at that time. Tilting the radar higher would have yielded the storm’s deadly secret of having a lot of moisture up high, and little down below. This is a recipe for a microburst. USAir 1016 had a similar set of circumstances, with just a “thin veil of rain” between them and the airport before the downburst of rain began. There are only a few scenarios that would lead to the precipitation being up high and little or nothing lower, among these are developing thunderstorm (microburst “setup”), virga or hail. None of them are things we want to be flying under! This scenario is a difficult one, but one that can be somewhat mitigated through proper tilt techniques. In the approach environment, the closer we get to the weather, the less our ability to “see it” due to the limitations on tilt. Start scanning the area and look for convective weather before you get into the terminal area. As you get in closer, supplement the onboard radar with additional queries to ATC. If you are approaching an area where you are unable to scan above the low altitude environment due to the limitations of tilt and distance, and only depicting light to moderate rain, yet the controller in the terminal environment is showing intense rain, you might be witnessing a Delta 191 scenario. ATC weather depiction ability in the U.S. has improved greatly since Delta 191, but one thing that has not changed is the ATC primary function of separating known traffic. Telling us about the weather is not ATC’s primary responsibility, but controllers do want to help where they can. Many controllers are not aware of the limitations of our radar displays, and they are also limited by their equipment and FAA legal has placed additional limitations on what they are, and are not, allowed to tell us. With this in mind, we need to have a solid understanding of what they can depict, and directly request the information that we need. [i] For more information, see your aircraft flight manual. B-777 Captain. Air Safety and Accident Investigator. Previous experience includes Flight Operations Duty Officer, Assistant Chief Pilot. Line Check Airman, ALPA Aircraft Technical and Engineering Chairman, Aircraft Performance and Designs Committee MEC Chair, Charting and Instrument Procedures Committee, Group Leader-Commercial Aviation Safety Team-Joint Safety Implementation Team (CAST)-Loss of Control-Human Factors and Automation, CAST-JSIT- Aircraft State Awareness. Fellow of the Royal Aeronautical Society, full Member of ISASI, AIAA, IEEE, HFES, FSF, AFA and the Resilience Engineering Association. I am available for consulting, speaking or providing training seminars to your organization. Please contact me at spmalmquist at outlook.com for inquiries. This entry was posted in Safety. Bookmark the permalink.